Chicken Soup! That's what you feed a sick mommy and a teething baby. Damon cooked up some homemade chicken soup with vegetables, noodles, dumplings, and lots of love. Me and Marlie ate it up. All better! marlieandme.com! That's right, we have our own domain name thanks to this tutorial by The Redhead Riter. So please pardon the dust around here until Google finishes redirecting everything. Oh, and update your bookmark with our new address. Next up, downloading the Alexa toolbar and mozRank because Google Page Ranks are so last year (literally). What are you loving this Thursday? Link Up! Yay for your own domain!!! I just got mine too -- www.mommydelicious.com. I may have to do a "Things I'm Loving This Thursday"post just so I could spread the word. 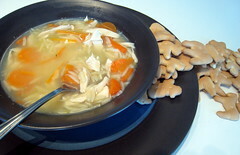 Oh, and you gotta love chicken soup! Yay!!!! I'm so proud of you! Woohoo! It looks good Ms. new dot com. Glad you found the tutorial helpful. Will do a tute on the MozRank soon to help you. Yay for the new dot com! Hoping to have mine up by the new year. That chicken soup sounds so yummy! Hope you and Marlie are feeling better soon. Samuel is teething so I understand how your feeling. Congrats on the domain! Aw snap. I've been off with the holiday. I'll link up this week.